Maharashtra are expected to gain more points that Mumbai from this game due to a better-balanced team. In the absence of their regular players, the 41-time champions, Mumbai are struggling in the Ranji Trophy with only four points under their belt after three matches. Pacer Dhawal Kulkarni, who led the team in the first three matches, will miss this match owing to an injury. This gives an opportunity to Siddhesh Lad who is currently going through a purple patch of leading the Mumbai team. The 26-year-old never led a Mumbai team at any age level thus far. Mumbai will now face their neighbouring team Maharashtra in Pune who also has four points after playing three matches. The visiting side will have a tough time due to their bowling which has struggled for consistency and also marred by injuries. Shivam Dubey has been only positive for Mumbai in this Ranji Trophy as the all-rounder has scored two centuries and two fifties in five innings and also took 12 wickets in three matches thus far. The Ranji Trophy game between Maharashtra and Mumbai will be played at the Maharashtra Cricket Association Stadium in Pune. Took first innings lead in a draw against Vidarbha. Conceded first innings lead in a draw against Baroda. Lost to Karnataka by seven wickets. Conceded first innings lead in a draw against Karnataka. Lost to Gujarat by seven wickets. The Maharashtra Cricket Association Stadium in Pune has consistently provided help for the seamers. The fast-bowlers enjoyed a good success in the last season at this venue. 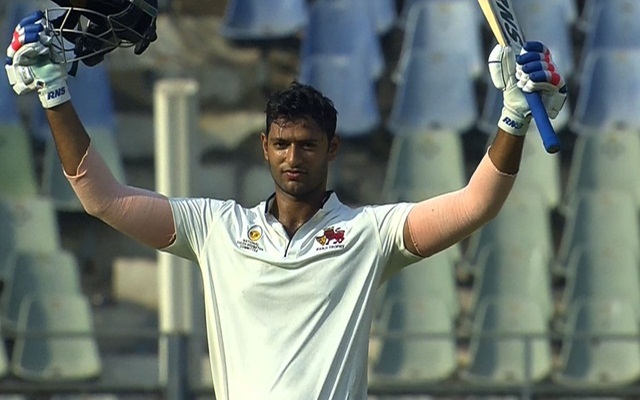 In the first round game of the 2018/19 Ranji Trophy played between Vidarbha and Maharashtra witnessed the defending champions getting bowled out cheaply in their first innings. Kedar Jadhav, Samad Fallah, Harshad Khadiwale, Rohit Motwani, Ankeet Bawne, Chirag Khurana, Anupam Sanklecha, Satyajeet Bachhav, Nikit Dhumal, Rahul Tripathi, Swapnil Gugale, Naushad Shaikh, Ruturaj Gaikwad, Mukesh Choudhary, Jay Pande, Ashay Palkar. Siddhesh Lad (C), Aditya Tare, Surya Kumar Yadav, Jay Bista, Shivam Dubey, Eknath Kerkar, Armaan Jaffer, Karsh Kothari, Akash Parkar, Shubham Ranjane, Dhrumil Matkar, Bhupen Lalwani, Shivam Malhotra, Royston Dias, Minad Manjrekar. Rahul Tripathi (C), Rohit Motwani (wk), Swapnil Gugale, Jay Pande, Ruturaj Gaikwad, Naushad Shaikh, Chirag Khurana, Anupam Sanklecha, Satyajeet Bachhav, Nikit Dhumal, Samad Fallah. Siddhesh Lad (C), Jay Bista, Armaan Jaffer, Aditya Tare, Surya Kumar Yadav, Shivam Dubey, Shubham Ranjane, Dhrumil Matkar, Shivam Malhotra, Royston Dias, Karsh Kothari/Akash Parkar. Ruturaj Gaikwad kicked-off his List A career in style with an average of 50 after three seasons. However, he didn’t have the same returns in longer format straight away. But in this season, Gaikwad scored 276 runs including an unbeaten century across five innings. Aditya Tare, Surya Kumar Yadav, Siddhesh Lad, Rahul Tripathi, Jay Bista, Ruturaj Gaikwad, Shivam Dube, Chirag Khurana, Anupam Sanklecha, Royston Dias, Samad Fallah. Shivam Dube is a must for multiplier option preferably as captain given his performances in this tournament. One among Siddhesh Lad and Ruturaj Gaikwad can be the options as the vice-captain. It has been a tough task at predicting the bowling line-up of Mumbai team in this season. Only Royston Dias seems to be sure shot of making it to the playing XI after a decent show in the last game. Dhrumil Matkar might retain his place due to his batting in the game against Gujarat. Maharashtra are expected to gain more points than Mumbai from this game due to a better-balanced team.